While I was in Israel earlier this month, I made a quick jaunt to Cairo and the only flight back to Tel Aviv was at midnight. At 2:30 in the morning, I finally arrived at Sarah’s doorstep with my over-sized luggage and met for the first time. I felt horrible arriving so late, and had repeatedly asked whether it was OK, and Sarah reassured me that she was accustomed to her husband arriving on flights at all hours of the night. We didn’t say much to one another on this first meeting. Just a few tired smiles, a handshake, and Sarah opened up her home to me. I dragged my suitcase upstairs to and flopped onto the bed she has prepared for me. The next morning, I awoke to the smell of pita toasting in the oven with za’atar and found a full Israeli breakfast on the table – including salad and labne. Mmm, savory breakfasts. 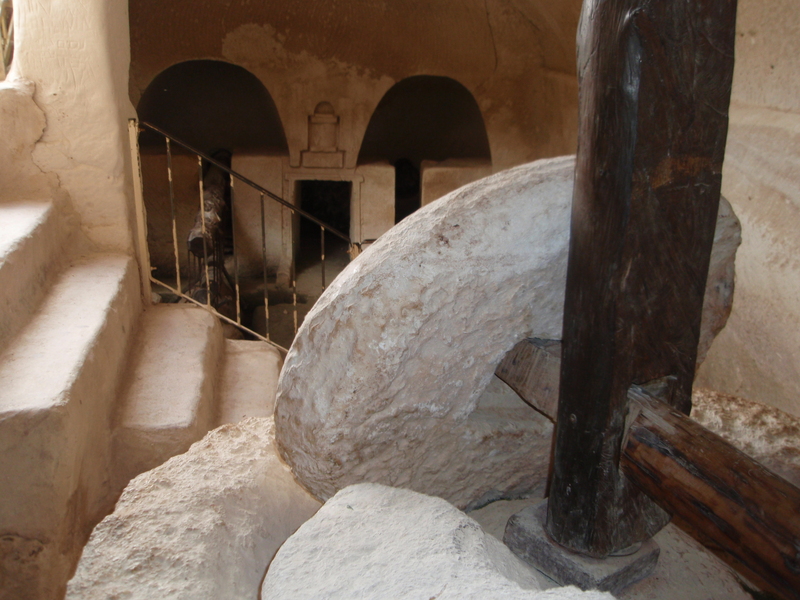 Over the next few days, Sarah played local tour guide, taking me to see the bell caves and ancient olive press in Beit Guvrin, the shuk in Ramle, and the Ayalon Institute on Kibbutzim Hill — the clandestine ammunition factory in operation from 1945-1948. In between our sightseeing trips, Sarah and I shared cup after cup of herb-infused tea. While I do make nana (mint) tea back at home, Sarah picks herbs from her front yard and I loved adding white sage and lemongrass to a steaming cup of tea. Between the two of us, we picked her yard dry, leaving only the hanging knotted rope from which her sons swing in front of the house door. We cooked together, I taking the lead on pancakes for dinner one evening and herb and arugula salad. Taking Sarah’s lead, after washing the arugula, I threw the water onto the yard — not atypical for Israel where there is a currently a drought (of course, I was not complaining about the warm sunny weather!). Sarah made pizza (including dough from scratch), arugula pesto, chicken soup, some braised meat that I missed out on trying. Most meals were accompanied by her home cured olives. On my last day, we stopped by a grocery store and I bought some fresh pita, still warm, for my long airplane ride home. Back in my apartment, I froze the remaining pitot to savor some of the flavors of my trip for a little bit longer. But, recalling Sarah’s comment a few days earlier while preparing pizza that the dough was a simple recipe and could be used for pita, I was inspired to make my own pita. I have made it twice since I returned and it is infinitely better than anything you can buy here. Adapted from Janna Gur’s The Book of New Israeli Food and Joan Nathan’s The Food of Israel Today. These pitot are the closest I have found to the ones you get in Israel, fluffy and perfect with hummus, for mopping up leftover salad dressing, or filled with chocolate spread. The trick to forming the pockets is baking in a very hot oven on a baking stone (or, if my case, on hot cookie sheets) and refraining from opening the oven during baking. Make the dough. Dissolve yeast in 1 C of the warm water with sugar. Allow to bubble up (takes ~ 10 minutes). Add to flour, olive oil, and salt in bowl of mixer. Knead with dough hook for 10 minutes. Add additional water, tablespoon by tablespoon, until dough forms a slightly sticky ball. First rising. Pour a little olive oil into a large bowl. Roll the ball of dough in the oil until coated. 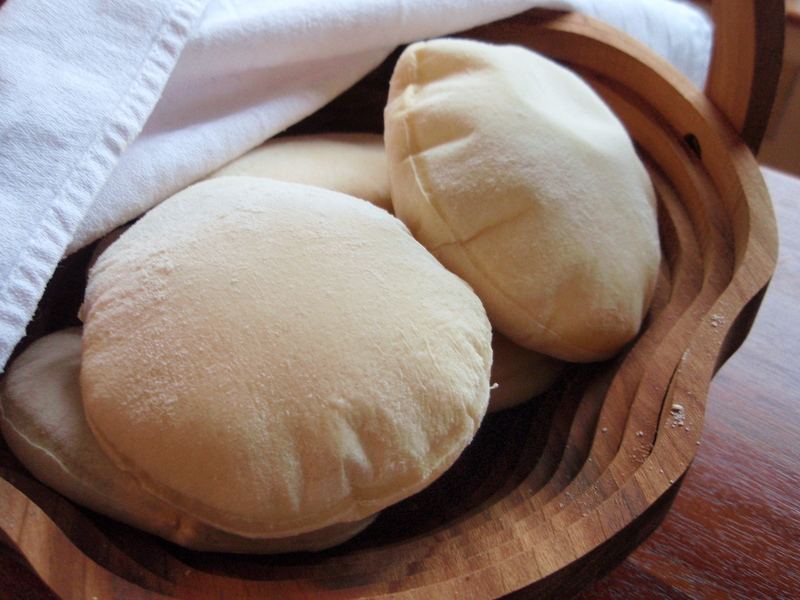 Cover the bowl with a damp kitchen towel and let dough rise until doubled (1.5 – 2 hours). I punch the dough down a few times during the rising. Shape bread. Most recipes call for you to split the dough into 8-10 portions to roll out individually. But I prefer to easier method of rolling out all the dough and using a bowl to cut out 5-6 inch rounds. You can bake the scraps or re-roll them (this time I rolled the scraps into 3 individual pitot with not-so-round results). Second rising and preheat oven. Allow the pitot to rise a second time for ~10 minutes. I do this on top of the oven as it preheats to 500º F. Heat cookie trays in the oven while preheating. Bake. Pull a hot cookie tray out of the oven and quickly transfer half of the pitot onto it and return to the oven. Bake until all pitot have puffed to form pockets, 3-6 minutes. Repeat with remaining pitot. Store. Pitot go stale pretty quickly, so the best way to store them is in in a bag in the freezer. You can reheat them for 20 seconds in the microwave after spritzing with a little water. On Thursday night, some friends organized an evening picnic on Boston Common to watch a little Shakespeare. The Commonwealth Shakespeare Company was putting on Comedy of Errors. Having spent at least a half-dozen summers in Manhattan and never making it to see Shakespeare in the Park (despite living anywhere from a few steps to a few blocks from said Park), I was very excited to finally partake in a little outdoor drama. And of course friends, good food, and wine. Our hosts, Noam and Tammie, invited picnic contributions, quoting the first Shakespeare play that I had ever read (and whose prologue I still have memorized), “Tis an ill cook that cannot lick his own fingers” (Romeo and Juliet, 4.2). Well, lick we did…read on, my friends. Having been privy to some little cherry tomatoes from my CSA (they called them pear tomatoes, but they were more globular than narrow) and a few tiny fruits from my tomato plant, I wanted to incorporate these precious beauties, especially rare this summer due to the blight, into a salad. I picked up a beautiful seedless watermelon and made what is a very common salad in Israel and the Mediterranean but whose mix of salty and sweet caused several of my friends to look at me somewhat askance when I announced, “Voilà, watermelon-feta salad!” as I unpacked my savory-sweet delight. Of course, Noam, the Israeli in our crowd, came to my defense when no one wanted to try the salad, saying (my apologies for paraphrasing), “This is a classic salad in Israel, but we tend to make it with Bulgarian cheese. It’s a great combination.” I dressed the salad and served up bowls with an encouraging smile during the intermission. By the end of the play, we were picking out the last bits of watermelon flecked with feta and basil ribbons, licking our fingers (well, that might have only been the cook, er, me). And the salad was so good, I made it the next night too. 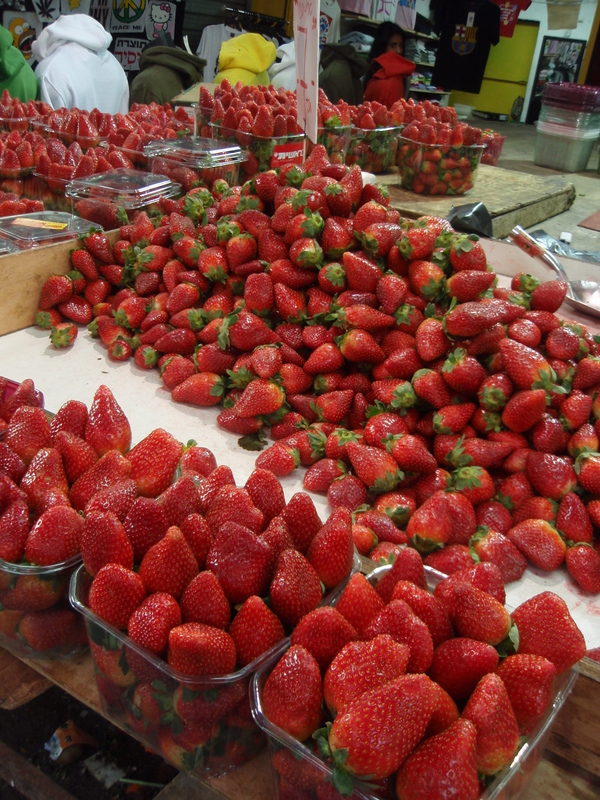 I first heard of and tried this seemingly strange and uncommon combination in Israel and wanted to get some background on why is so popular there. A source on Wikipedia suggests that watermelon originated in the Nile valley. Add this fruit that is 92% water to some sweltering heat, described by a favorite food blogger as “wading through warm honey,” in a Mediterranean area known for salty semi-firm yet crumbly cheese, and the experimental combination seems inevitable. Once tried, the desire to repeat the experiment is nothing short of addictive. The juxtaposition of textures – the creamy saltiness of the feta, the crisp sweet chill of the watermelon – play off one another nicely. I added the crunch of fresh-from-the-farm tomatoes and added some basil from my windowsill garden. There are so many variations and I’ve made a bunch of suggestions at the end. This salad is best served cold; make sure to add the dressing no more than 20 minutes before serving, as you don’t want the watermelon to lose its turgor. 4-5 handfuls of spinach (1/2 a 10 oz bag…i.e, 5 oz) or a head of red leaf lettuce or other leafy greens. – ~ 1/4 C feta — I use Israeli goat milk feta that is softer and more like Bulgarian cheese than a hard Greek-style feta (the brand is Pastures of Eden and I buy it at Trader Joe’s; I like it because it is not too salty; I found a nice review about it in the San Fran Chronicle). It is best to keep the store the feta in water and change the water every few days. Assemble salad: Rinse and spin the spinach or greens and rip into bite-sized pieces. Quarter the tomatoes. Cut the watermelon into ~1-inch cubes. Crumble feta over the salad. Make dressing: Chiffonade the basil and put into a small bottle (I use an empty spice container). The dressing is a standard vinaigrette (typically 3:1 oil: vinegar) that’s just a tiny bit lighter on oil – add oil, vinegar, a few grinds of pepper and a pinch of salt. Shake up to emulsify. Dip a green leaf into dressing to taste for salt and adjust seasoning for taste. Chill salad until ready to serve. Dress ~ 15-20 minutes before serving. Here are a few more recipe ideas I found when looking around the web, one from Janna Gur for Watermelon Cubes with Salty Cheese and Capers and another Ynet article including a salad from Erez Komorovsky that adds blackberries and red onion to the mix. From the outside, The Hummus (18090 Collins Ave, Sunny Isles Beach, FL; 305.974.0031) looks like it might be just another of the trendy hummus houses that have popped up all over NY in the past few years (my favorite being Hummus Place in my old ‘hood). With a sign above the door that says “Fresh Hummus, Healthy Proteins” and the emphasis is on the nutritional value of the chickpea, this newly opened niche player is aimed at a vegetarian and health-conscious clientele. Walk in, and there is a bright friendly Miami vibe and a distinctive Israeli feel. The color scheme is apple green (or, what I personally call Kate Spade green) from the walls to the chairs. The A/C is on, but the door is open to let in the breeze just a block off the Atlantic in this strip mall (location might not be ideal, especially being perpendicular to Collins, but that’s kind of par for the course here in Sunny Isles, and this aint South Beach). And of course there’s a bar with high stools, wifi, and a laptop browsing Ynet (English version here). I wasn’t sure what to order and stared at the menu in English and Hebrew on the wall for a few minutes, finally querying, “hummus shakshuka?” at this combination of familiar favorites. Alon, who I would soon learn is the owner-chef, said that it is their specialty and to the best of his knowledge, he is the first person to put these two dishes together. That was enough to convince me to try it along with some lemonana (lemonade with nana, fresh mint). I felt perfectly comfortable walking in, dropping down my backpack, and plugging in my computer. Before I was even able to log on to the free wifi, setting up to do a little work out of the beating-down sun, Yael the waitress, set down several small dishes: pickles and marinated olives with lemon rind, radishes and onions, and seasoned toasted pita. Admittedly, I mainly nibbled on the pickles and olives. When my steaming hummus shakshuka was ready, Yael looked at my table already scattered with my papers and laptop and said, “Eh, there’s no place for your food,” and I promptly moved my bags over and pushed my computer to the edge. She serves everything up with a sweet but no-nonsense, “B’seder?” — Is everything OK? — and the patrons nod, already too engrossed in their food to mutter much more than a grunt and a simple non-verbal cue and a smile. I started by dipping the fresh pita, crisp on the outside, fluffy on the inside, into the center of the plate, scooping up some slightly runny egg bathed in a spicy tomato and pepper sauce. 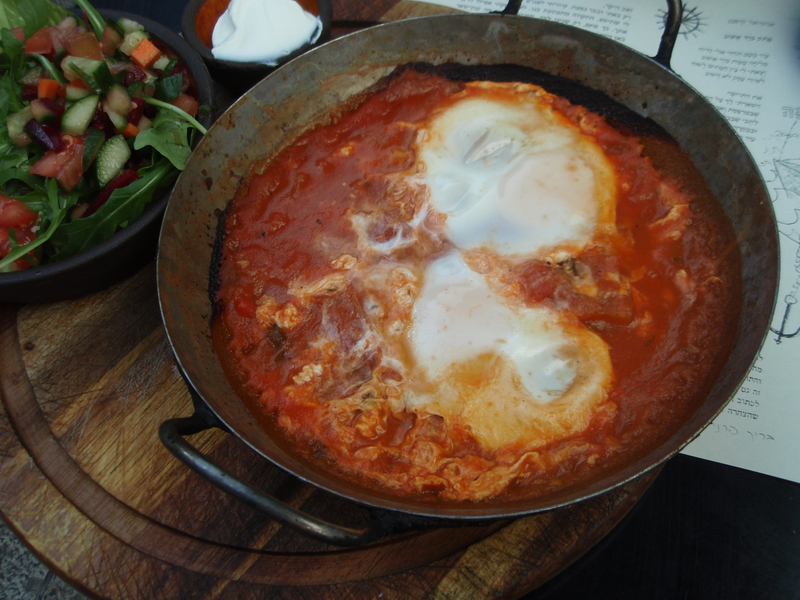 A great shakshuka reminiscent of what I’ve eaten in Tel Aviv. Eventually I made my way towards the outside to hummus, mixing it with a bit of the sauce, another good combo, essentially a fresh, warm, dense hummus with matbucha. I couldn’t finish everything on my plate, and brought home nearly a pint of hummus and sauce which my family later devoured. When my snapping pictures of all the food (including standing on chairs) made it clear to owner-chef Alon that I was more than a mere hummus consumer, he insisted that I try some falafel – refusing to take no for an answer when I explained that I was already quite full. … but did accept the filfil (singular of falafel) that he had fried up special for me. The falafel crust was uber crispy – the way it’s supposed to be (not baked the way that Chickpea in NY does it) — without being greasy. When I commented that the falafel was green the way I like it — Alon, eager to share his love of food and recipes, explained that there are two types of falafel: Egyptian which is completely green and made from fava beans, and Lebanese which is yellow and made purely from chickpeas. He said that most Israeli falafel is a mixture of both fava beans and chick peas, and that’s how he makes it. I had actually always thought that the green color came from parsley and other spices. While I could had no room for dessert, I couldn’t resist one final picture of a gorgeous malabi, an almond pudding, covered with rose water sauce, that one of my neighboring diners ordered. While there is a familiar and homey feeling to the restaurant, I did stop short of asking my neighbor if I could grab a spoon and taste his dessert, so unfortunately I can’t report on how the malabi tasted. The restaurant was a bit empty when I arrived around 11:30, but as I sat working on my computer, there was a rush of quick business lunches and beach picnic-ers around noon. And after a short lull, business really picked up around 2 pm with many families drawn in by the colorful and relaxed atmosphere, grabbing a late lunch, and several pre-shabbat snackers munching at the bar. As a newly opened restaurant, there are some minor kinks to work out. A few diners seemed annoyed at the delay in getting checks promptly just before closing, coming up to the register rather than waiting for at their tables. But the staff, seemingly committed to ensuring that service quality remain high,was firm but pleasant in leading the customers back to their tables and bringing checks within moments. Notably, The Hummus is open from 11 am – 3 am, or “until we run out of hummus” Sunday-Thursday, until 3:30 pm on Fridays, and 1 hour after sundown on Saturday night. I would suggest calling to confirm Saturday night hours. The restaurant is under the supervision of Kosher Miami. … and then I later bought a few of their CDs. Below is one of the songs that was playing in The Hummus the afternoon when I visited. I am no good at surprises. I come home from a trip with presents for family and friends, and I can barely get off the plane before I’m calling them up to say, “I’m home, guess what I brought you…No, don’t guess, let me tell you!” I have blown surprise parties. For real. Just don’t tell me about them. Or if you do, make sure I know it’s a surprise. And remind me that means I’m not supposed to tell the guest of honor. And that it means I have to show up on time (or in my case, early…or very very very late to avoid walking in with the guest of honor and saying something like, “How fun, I’m so excited for your birthday party…” as s/he reaches for the doorknob). So, since I’m making dinner tonight for a friend, I can’t resist. Here’s the menu. And a sneak peek at one of the dishes since I made a test run earlier this week and I liked it so much, I’m repeating it. And, oh guest of honor, if you happen to check out my blog today, well, the surprise is ruined! Vic and Joe (and the adorable Jackito) were my gracious and amazing hosts during most of my time in Panama City. Not only did Vic make a decadent “chocolate explosion cake” that we took on our Santa Clara private beach picnic, but she shared this version of an Israeli salad of tiny chopped tomato and cucumber, salted with olive juice and seasoned with parsley. It became an instant favorite and I’ve been making it since I came home. Finely chop tomatoes and drain some of liquid in colander while chopping remainder of vegetables. Finely chop cucumbers (some remove seeds and peel, but I don’t bother). Slice white and light green parts of scallions. Slice olives into ~4 pieces each. Mix vegetables together and sprinkle with chopped parsley. Season salad with juice of 1 lemon, 3-4 T of olive juice, 2-3 T olive oil (I used Unió — this oil really tastes like olives!). When you write a food blog, people think that you cook all the time and that everything you make is gourmet. While I do cook quite frequently, most of what I make is really pretty simple. Recent past dinners have included a big plate of green beans with toasted almonds. Oven-roasted corn on the cob covered with grated cheese. Marinated zucchini alongside roasted cumin and cayenne sweet potatoes. Panzanella. As you can tell, I eat a lot of simple veggies. So, it is such a treat when someone cooks dinner for me. And a few weeks ago, I was the recipient of just such a treat. Not only was I treated to a home-cooked dinner, but my Israeli friend C. baked me pitot (the plural for pita in Hebrew). C. had been disappointed to learn that despite my supposed foodie status, I use a bread machine to make challah. “What, it braids it for you in the machine?” he asked. Well, if I am no chemist, then I am certainly no physicist. And this is only one of his manifold gifts. He plays guitar, has a knack and appreciation for vocabulary and grammar in all the languages he speaks, and combines a piercing intellect with a direct, no-nonsense style that is refreshingly candid without being harsh. … and then rolled it out about ¼ inch thick (or a centimeter, in keeping with the scientific and Israeli metric system). Now, this is where C.’s methodology differs from that of other pita-makers. And it was at this point that C. launched into an explanation about what conditions are important in helping the pita form its pocket. Most people normally separate the dough into about a dozen small balls and roll each one into a flat round. But having each pita the same thickness helps ensure consistent results (granted, we did not discuss the possibility of all the pitot failing to form pockets…). And, perhaps more importantly, rolling out the dough only once is significantly more efficient than rolling dough out twelve times. And, I was getting hungry. OK, back to physics. 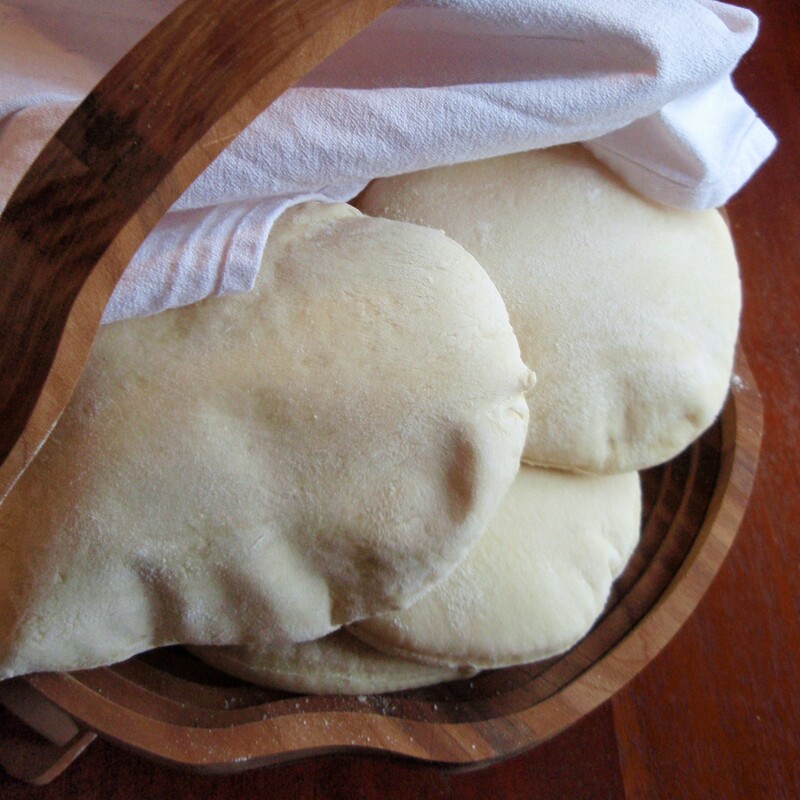 Roll the dough too thin and the pita will be crisp and cracker-like; too thick and it may never form a pocket. So, one centimeter is what has worked best in C.’s experience. I think he mentioned something about thermodynamics in the oven, the expansion of gas in the dough as it’s baking, the importance of an oven that distributes heat evenly from top and bottom to ensure equal pita sides (which he has yet to master) … and I’m not sure what else … I was getting hungry. So C. forged ahead, cutting out pitot in just the right size with a bowl. Rather than re-rolling the scraps (inefficient), C. cuts the pitot close together to reduce wasted dough and bakes the triangular/square/star-shaped scraps which often form mini-pockets with crunchy end-bits. As he was cutting, C. continued to explain, “the ambient temperature is important for the rising of pitot,” so I checked the wall thermometer: a pretty high 74˚F – plus, it was humid outside. This did not bode well for the pita. C. looked concerned. My stomach grumbled. My bread machine was looking pretty good right about then. But so was the pita as C. finally laid it out on the baking sheets to rise as he turned on the oven to preheat (500˚F). He said it would it would take the oven longer to preheat than it would to prepare the rest of dinner. While the pitot were rising, we set to work on everything else. I sliced up a caprese salad, cut the tips off the haricots verts that C. sautéed with garlic and dill, and then we threw salmon on a grill pan with some olive oil and freshly-squeezed lemon juice. And the pitot puffed as we sat on the kitchen floor in front of the oven. We took one pita batch out and put the next in. I continued to sit in rapt attention in front of the oven door. And then the smoke alarm went off. I have never been a fan of cooking salmon on a stove top. C. quickly disconnected the alarm as I removed the grill pan from the fire and opened every single window. And kept checking the pita in the oven (through the glass…I did not open the door!). After we pulled the last pita out, perfect pockets intact, we sat down to eat, mopping up the olive oil and balsamic from the caprese with the warm fluffy dough. I am not sure I’ll ever be able to buy pita in a store again. Learn, laugh, and nosh your way through an evening of music, film, dance, traditional (and not-so-traditional) study along with coffee, cheese cake and more! Educators and artists from New York and Israel will present engaging programs until sunrise in a contemporary twist on the age-old tradition of Tikkun Leil Shavuot, free and open to everyone at every level of Jewish observance or knowledge. In attending these tikkuns over the past few years, I have participated in discussions about the election of Sarcozy in France with a political history expert, gone to cooking classes (my favorite and the source of a great summer salad recipe to be shared when I have a chance) with Israeli chefs, seen a re-creation of a Tel Aviv night club with trance music for those comfortable listening to music on a yomtov (holiday), and tried out an aerial yoga class. Classes span the height of the JCC building on at least six of their floors including the indoor pool, and the building is literally crawling with all generations, manners of dress, religious levels, and languages. I loved that there was truly something for everyone and that so many different people came together for this celebration of learning and art in what some think of as a “just religious” holiday. When I was given the opportunity to teach a class this year at the tikkun run by my own minyan (lay-led prayer group, for lack of a better term), I embraced to chance to attempt a not-so-traditional class. I led a dance and movement session for a handful of friends and community members (with a diversity of dance, yoga, and movement backgrounds), based largely on key elements of jazz dance. In researching other dance-related Shavuot celebrations for inspiration, I came across two that took place in Israel this year, one called Hagiga (celebration or festival in Hebrew; article in DanceInIsrael.com) and hosted by Vertigo Dance Company in their Eco-Art Village and another called Hagiga Levana (“White Festival;” article in DanceInIsrael.com) hosted by Adama in the Negev desert. Below is a video about Vertigo Dance Company’s “Birth of the Phoenix” piece that they performed at this year’s Hagiga (the set incorporates a traveling geodesic dome — think Epcot Center). In my own jazz class Thursday night (the first one I’ve taught in a while), I tried to incorporate some of the fluidity of modern and contemporary dance movement into a workshop focused on isolating body parts (head, shoulders, ribcage, hips) and counting out different rhythms. Another Shavuot tradition is to eat dairy, so my minyan sponsored a dairy potluck before our tikkun. I prepared this tart as an alternative to quiche. I have to say that though I am rarely a fan of potlucks (how many pasta salads can one person eat??? ), I think our minyan must be the foodiest of all groups I have ever encountered. There was amazing variety (polenta, veggie chili, watermelon feta salad, and bucatini just name just a few), healthy options, and lots of vegetables. I am in the process to pulling together everyone’s recipes to share. Adapted from a recipe prepared by Natasha at 5 Star Foodie when she made a 7 course French-inspired brunch for her daughter’s birthday (!!!). I’ve been waiting for the right occasion to make this tart and Shavuot seemed perfect. Most people make quiche, but I hate making crusts and I’m not a fan of heavy creams or custards. The original recipe calls for swiss cheese, but I wanted to try something a little bit different and was planning to make it with brie. When I couldn’t find Président brie in Trader Joe’s or Whole Foods (what, you think I plan these things in advance after thinking about the food for weeks? No, I just embrace spontaneous action after way too much thought — see my first ever post, “no n pensare, fare” — and it usually works out pretty well! ), I discussed various options with the cheesemonger at Whole Foods and realized I had an amazing cheese – a Raclette made by Ermitage and imported from France – right in my fridge. Raclette is a Swiss cheese that I think has a nicer texture and flavor (nutty?) than the traditional holey and plasticy “swiss cheese” I grew up with in the US. It has a semi-hard texture and is fabulous melted with apples or pear thinly sliced and poached in white wine. Serves 10-12 as side dish. – 1 1/2 cup shredded raclette cheese – 2 oz (1/2 a package) – this is a pricey cheese from France ($18/4 oz from the Kosher Marketplace — see Resources) – aha, I still have some left to make a fruity, winey melted dish! In a large bowl, combine all of the ingredients together to blend well. Batter will be thick. I initially freaked out because unlike quiches, this is not liquidy and there is no custard. But, it’s OK. Just butter your tart pan (you can use one with a removable bottom or a nice porcelain one like I did…either should work since this won’t drip out), spoon the batter in, and spread it evenly. The tart will rise a bit as it bakes. Bake for 45 minutes or until golden brown. At 45 minutes, mine was still a bit jiggly, so I kept it in for another 10 minutes — if you’re counting, that’s 55 minutes total. At that point, it pulled away beautifully from the sides of the pan. Mine showed a little bit more green zucchini than Natasha’s, cut beautifully, and was dense and tasty without being overwhelming. One of my favorites among the top 10 is Hadise from Turkey (came in 4th), singing “Düm Tek Tek” — it’s the Middle Eastern rhythms that I like. I was not a fan of the song sung by one my favorite singers, Patricia Kaas, to whom I was introduced by the family I lived with during a summer exchange in the Loire Valley and the Vendée, who represented France. I did really like Estonia’s “Rändajad” performed by Urban Symphony (came in 6th). About six weeks ago, I wrote about one of my favorite duets representing Israel in the Eurovision contest in Moscow. Well, Noa and Mira Awad made it to the Finals last night and will be competing on Saturday, May 16th against Turkey, Sweden, Portugal, Malta, Finland, Bosnia-Herzegovina, Romania, Armenia and Iceland.